09-10.06: Kazar Rimskij entered four shows in Orlando, Florida and won 4xBest of Breed, 1xBest in Hound Group and 2XBest in Hound Grup 3. 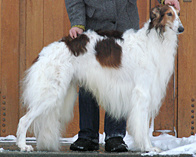 He also achived the IABCA title: International Champion (inofficial titlein U.S.),- all at the age of 10 months. 20.05. 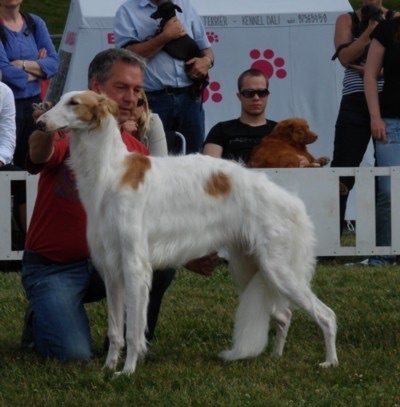 Kazar Rodina won CAC, BOB and Group-3 at Mo (N), Only 9 month and 2 days old! Owner Kleo Delaveris. 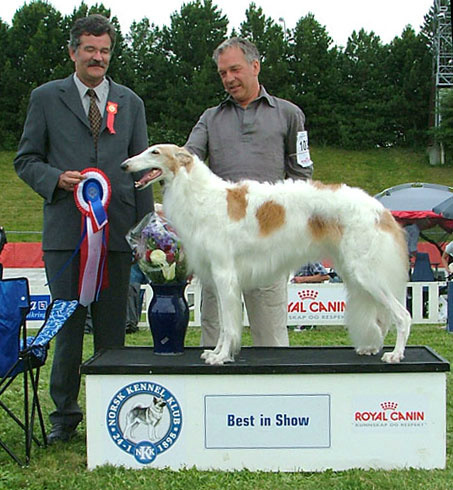 BIS, Ch Kazar Oleg was Mostwinning Borzoi no 3, 2006 in Norway. Congratulations Susanne Strøm, Knl Steppdance! 02.07. Another great weekend for Kazar! 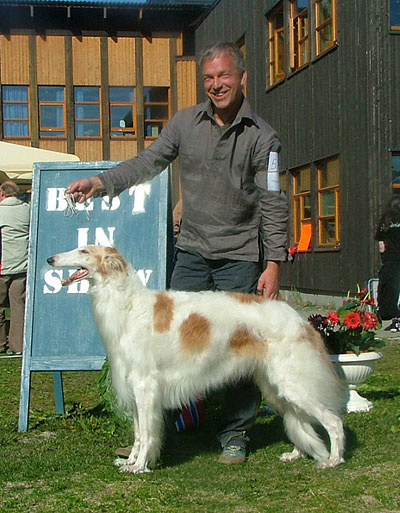 Int, Nordic Ch Kazar Olympia: BOB, Best in Show-2. Olympia had won the Group the day before at NKC and entered the BIS-final later in the afternoon. There she went all the way and won BEST IN SHOW ! BM-2, CAC, New Champion: Kazar Qadir. 24.06. Ch Kazar Oleg went BOB ond BOG-3 at Oppdal (N). 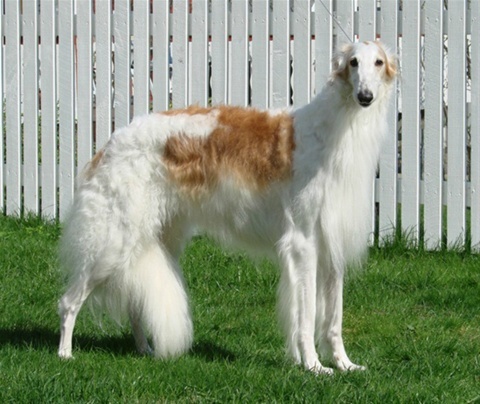 27.02 Int, Nordic Ch Kazar Olympia became the top winning Borzoi on the ”Sighthound of the Year 2005” list. 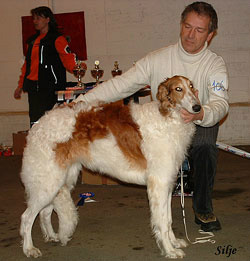 Her brother, N.Ch Kazar Oleg (owner: S. Strøm) was no 2 and best male. 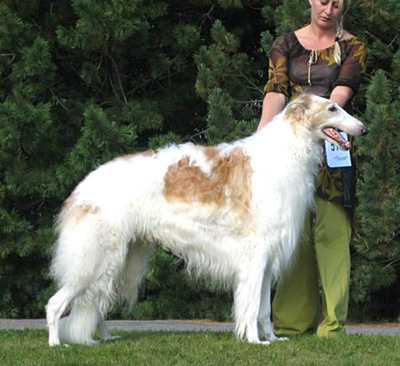 On the Borzoi Comity’s list “Borzoi of the Year 2005 Olympia placed as no 2 (only points from the breed are counted here). On this list Ira was beaten with two small points by her half sister Ch Le Sphinx Philippa. 12.11. 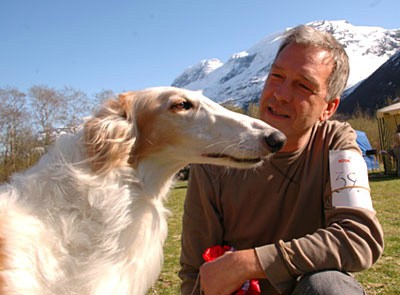 Orkdal Dog Club: BOB, BOG-4 Ch Kazar Oleg (Owner: Susanne Strøm). BOS, CAC: Kazar Qasida (Owner: Kristjana Kristiansen). 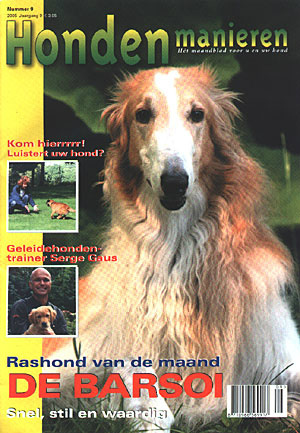 Kazar Orion is cover borzoi on the last issue of ”Hondenmanieren”, the largest dog magazine in Holland! 27-28.08. Int, Nordic Ch Kazar Olympia was BOB and Best of Group-3 both days at the Dog Festival in Trondheim (N). Judges: Nenne Runsten and Rita van Meechelen. 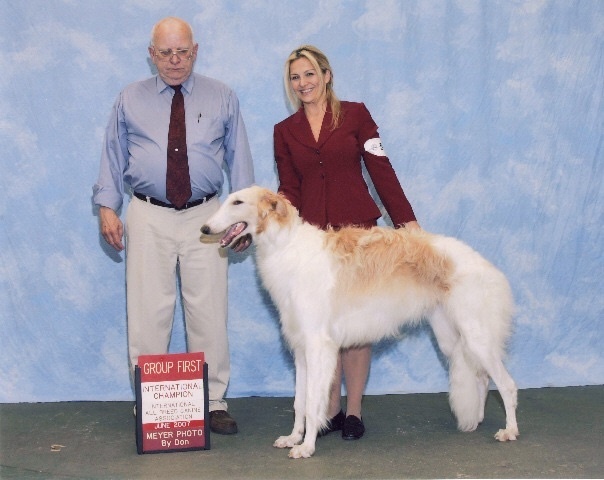 26.05 NKC show in Trondheim (N), judge: Agnes Ganami Kertes. 11.06 Ch Kazar Olympia was BOB at the NKC show in Drammen (N) under Nils Molin. 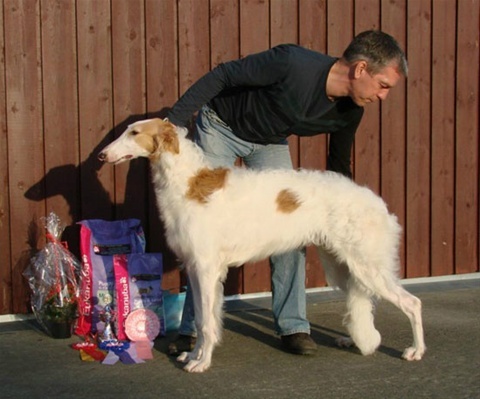 12.06 CH Kazar Olympia went BOS, Danish and International Champion at DKC show in Hillerød, Copenhagen! Judge: Åke Sjøstrøm. 18.05.Int.and Nordic Ch Kazar Olympia was BEST IN SHOW at an all breed show in Oppdal (N). 19.05. Int. and Nordic Ch Kazar Olympia was BEST IN SHOW-3 at an all breed show in Oppdal (N). 24.04 A great weekend for us! Ch Kazar Olympia went BEST IN SHOW at an all breed show in Sundalsøra (N) Judges: Ritva Raita and Frank Christiansen.